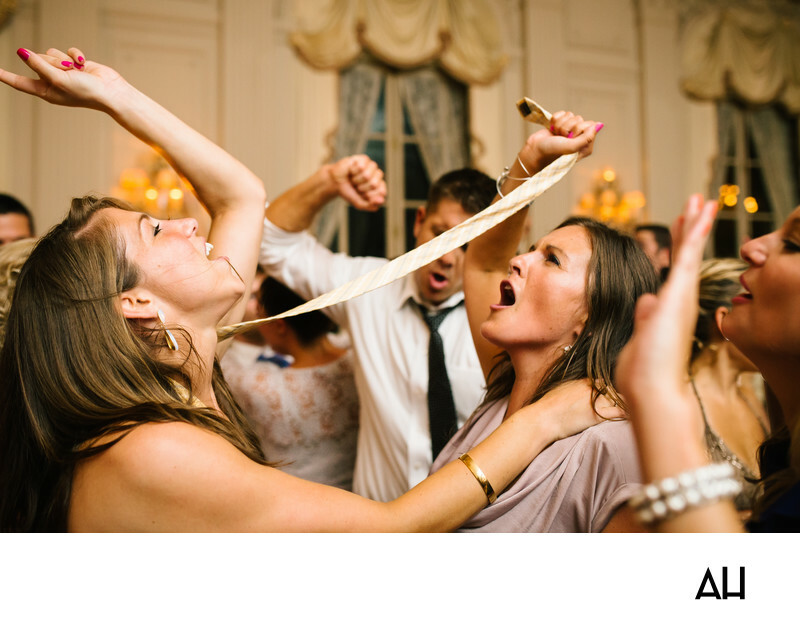 As a Rosecliff Mansion Wedding Photographer I capture many moments of uninhibited celebration. The mansion is one of Newport, Rhode Island’s finest. Awash in history, has a legacy of lavish parties that every wedding lives up to. The space transports guests back to the Jazz Age, encouraging them to join in the festivities whole heartedly. Music filled the ballroom, the band got the guests on their feet, and I took my place as the Rosecliff Mansion Wedding Photographer of the evening. This image froze an instant of the revelry. Nearly everyone in attendance is dancing, singing, and joining in the merriment of the night. Prior to the photo, the women had kicked off their heels and the men loosened their ties as they swung about the dance floor. The venue is elegant and grand, but no one in this picture is paying attention to the beauty of their surroundings. The memories made throughout this reception will be cherished by the couple and their guests for years to come.